I honestly thought HTC had sent the wrong phone in the mail when the U11 Life arrived. The new phone looks almost identical to its namesake at first glance — and that’s by design. Of course, on closer inspection, the differences are pretty clear, particularly when you’ve got the standard U11 on-hand. The Life is essentially the budget version of HTC’s latest flagship, running $349 — actually a pretty steep discount over the U11’s $649. That doesn’t come without cutting some corners, of course — and HTC found places to cut back just about everywhere. Even still, the phone looks to be a pretty solid deal for the price. The most immediate difference is the downgraded display, which drops from a 5.5-inch Quad HD to 5.2 inches at 1080p. Perfectly fine for a budget handset, but the kind of thing you’d be pretty disppointed with if you payed more than $400 for thing. The other big aesthetic change is the move from the extremely reflective glass finish to the just kind of reflective glass. That’s both a move to lower costs and to ruggedize the phone a bit more by sticking the coloring under the surface. But don’t worry, it’s still a fingerprint magnet. The rear facing camera has been knocked down from 16-megapixels to 12, the dual-LED is now a single and optical image stabilization is gone. Interestingly, the front-facing camera is staying put at 16MP. The flagship Snapdragon 835 chip is now a middle 630. The battery has been bumped down from 3,000mAh to 2,600. The entry-level 64GB of storage and 4GB of RAM are now 32GB/3GB. Otherwise, you’re getting a lot of what you’d also get on the standard U11, including Edge Sense, the squeezable sides that Google coopted for the Pixel 2. Though here, as with the U11, it can either trigger Google assistant or Alexa, rather than having to call them out by name. 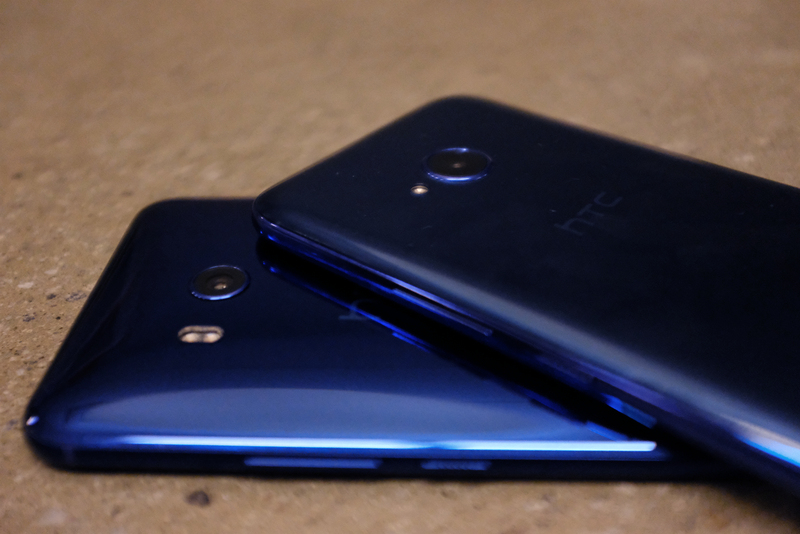 HTC’s also added the ability to use it to launch apps and trigger features within them. The water/dust resistance is the same rating at IP67. The phone also ships with the company USonic earbuds, which feature built-in noise cancelling. The handset ships with Android Nougat, but HTC plans to upgrade it to Oreo within a month of so (with an Android One version being made available in other markets). As far as potentially cannibalizing potential U11 sales, HTC says the plan here was to stagger release by about six months, in order to offer up a cheaper alternative as interest in the company’s latest flagship was naturally winding down. Interestingly, the company has also announced the six-inch U1+, though that one’s not destined for sale in the US. The U11 Life, meanwhile, is currently available online. It will hit T-Mobile stores on November 3.